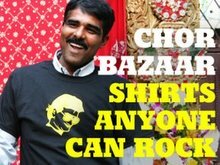 CHOR BAZAAR WORKSHOP: Are We Spelling it Right? Are We Spelling it Right? Here is another random post. On a recent trip to Jackson Heights I noticed the Spelling of "Bazaar" as Bazar, as in "Apna Bazar Cash & Carry". Are we spelling it wrong? Could the illustrious, Apna Bazar Cash & Carry be wrong? Hey Milk is on sale for $2.49...gotta make that homemade Paneer.